At the barn where I keep Harvey, there is a delightful woman (Sara) who takes weekly lessons -- she always a big smile and great enthusiasm. Sara often borrows horses to ride in clinics, and she rode in a Lendon Gray clinic for adults last year. She told me that most participants were riders that were decidedly undiva-like on capable but modest-looking horses. There was one lady, though, on a big-moving warmblood and wearing fancy gear. She was having trouble controlling her horse. Round and round the ring she went at a huge trot that was close to a lengthening. Lendon's words to the rider were to HALF HALT, SLOW DOWN, but the lady seemed oblivious. Lendon is not one to mince words, and she boomed out "I am NOT IMPRESSED. Not impressed AT ALL!" The Lendon story, and particularly her sentiment, is a lead in for my product review. You know, I'm kind of a sucker for new-fangled products, from the AstrideTM surcingle to the Shoulders BackTM posture improver. If they're silly and frivolous, at least my gadgets have good intentions, -- helping me, or my horse, improve. When it comes to training "shortcuts," I draw the line. No draw reins. No crank nosebands. No flash attachment binding my horse's mouth shut. When I saw the EquiheelsTM product ad appearing at the top of my Gmail mailbox, I thought it might be a new heel stretcher for riders. Gadget alert! Ever hopeful, I clicked. Nope, it's not a gadget to help you fix your riding problems. It's a heeel insert that supposedly creates the appearance that your heel is down while allowing you -- in fact encouraging you to ride en pointe like a ballerina. In other words, it's a gimmick to make you look like a better rider than you are. To quote Lendon Gray I am NOT IMPRESSED. Not impressed AT ALL! I've worn, and seen other people wear, ill fitting boots that drop down at the heel -- the boot heel is several inches below the actual heel. It's obvious that the human heel is not at the bottom of the boot -- no one's ankle breaks at that telltale funny angle. Judges and trainers are not fooled and like me, NOT IMPRESSED. Did it occur to you that when the heel is down, the rest of the leg becomes more secure? The thigh drops down, the seat is closer to the saddle, and the rider finds a sweet spot of stability/balance. Your product actually prevents the rider from assuming a more correct position. 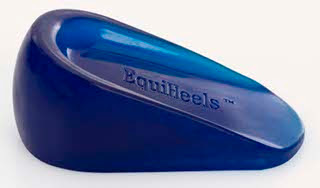 Yes, EquiHeels are legal and can be used in the show ring. Because they fit perfectly inside your boot, the best part is that no one will even know you're using them! Although you may be surprised at how comfortable they are to walk in, we recommend that you simply insert the EquiHeels just prior to mounting your horse, and remove them soon after dismounting. I'm all for whatever tools help us to legitimately improve our horses or our riding. After all, I'm the queen of gadgets. But for equestrian sports (and probably any sport), products that try to circumvent the old fashioned notion of "paying your dues" are doomed to fail. If there was an easy button for being a good rider, we'd all be good riders. Are you sure it's a real product and not a parody? Because if it's real, whoever picked out the photos for the website needs to be fired. Looklike the maker don't do their research. Wish they can answer your question. I second your opinion Stacy! Good job outting the little buggers. For years. But they are supposed to just help lift your heel above the seam line until new boots are broken in. Then you remove them. The intended purpose of this gadget is just wrong. When are people going to learn that this is a sport that takes TIME to perfect and even then, you always have things to discover. When I got my new tall boots I just wrapped my heel with a maxipad. My anklebones would get horrible blisters otherwise. And these boots fit great! Hunter eq riders have been stuffing their heels with various materials for years. Anon, that's interesting! I can't believe it's that widespread! I grew up riding at a hunter barn with a lot of eq kids -- Stacia Klein (now Madden) rode there, for one. Granted it was a while ago (70s) but no one did it then to my knowledge, not so much because they wouldn't if they needed to, but because they didn't need to. 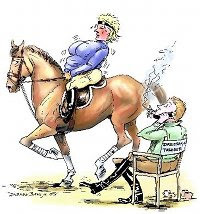 If you have to stuff your heels to mimic proper equitation you probably have other things going on with your riding to keep you from going to the top levels. Just my opinion. 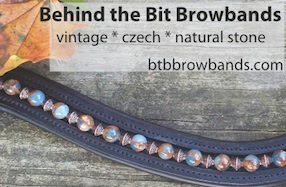 This product seems like some other silly things that people would only use in the show ring. No offense to people who enjoy showing, but I find that the judging extremely subjective and encouraging to tricks like Equiheels. What is scary is they recommend them for jumpers. It seems you'd really want a secure seat for that, plus you're being judged on performance and not a vague set of criteria. But this is not it! I can't imagine trying to ride with them, my legs would be flopping all over the place. Pitch a few riders off over a fence because of them and maybe someone will sue? oooh, i like halt near x's idea of a parody site! there have just been too many weird riding gadgets over the years. remember the one that makes you arch your back? equitation riders are already artificially contorted into ridiculous, purposeless positions for the sake of ribbons... it's almost like a contest to see who can be posed the most ridiculously! Goodness me, whatever next? Are we going to see people having 'heel implants' surgically inserted into their feet?? This product is ridiculous and it needs to be stopped before someone gets seriously hurt and sued. I'm also not impressed by gadgetry. I actually know quite a few people who use EquiHeels. Most riders don't want to talk about it because they want to keep their competitive edge. But they do help. They are a quick fix for sure, and don't replace hard work. Like some other commenter said, people have been doing this for years. I checked out http://www.EquiHeels.com and it looks like they have a few free bonuses now when you purchase also, which include more exercises (on and off the horse) to improve equitation.